American craft beer transactions are the best way to get American craft beer that you normally can’t get your hands onto. Finding someone on the other end that you can count on, creating a relationship of “friends” without every meeting them is bliss. I am fortunate that my transaction buddy in Maine, Matt, have created such a relationship. It is nice to receive a package that you never even knew about, especially when it is full of crazy goodies. 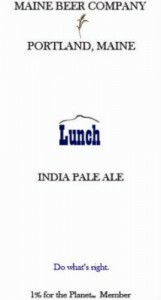 I have had three other American craft beers, via Matt, from Maine Beer Company. 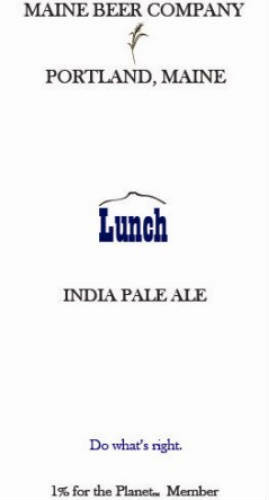 All three have been well above average and high on my list of “have again.” This time something knew was in the box: Lunch an American IPA. Lunch might come from the east coast (actually about as far east as you can get) but the hop profile of pine and grapefruit citrus quickly make your senses think back to all those wonderful west coast IPAs. Well balanced, easy to drink, and refreshing with only a slight bitterness, this beer was fantastic after a day at the pool. Thank you Matt for another great beer and kudos to Maine Beer Company for hitting four for four on their beers. Keep up the good work. Enjoy! Useless Fact: Toward the end of her life, Sarah Bernhardt had a wooden leg and often wore it on stage. The “Divine Sarah” slept in a coffin, owned her own railroad car, and played Juliet when she was seventy. Kosmyk Charlie’s Y2K Catastrophe Ale by Central Waters Brewing Company turns out to be beer number 241. An American barley wine there are dark fruits, caramel, toffee, brown sugar, alcohol, and a nice smoothness to such a large beer (it is a 2009 bottle). Central Waters continues to impress battling New Glarus as my favorite American craft brewers from Wisconsin. I have known New Glarus longer so they will hold onto that top spot for a while but they should notice the shadowy figure behind them. Enjoy! Useless Fact: Slapstick comedy is named after an actual slapping stick. The stick, which came to be equated with broad farce in the sixteenth century as part of the Italian commedia dell’arte, was used by the comic hero Harlequin to whack the rumps of artless stooges. It was made of two pieces of wood joined together to make a slapping sound when it hit. When I think specialty American craft beers, I think of two kinds: ones that use some type of hook that compliments the beer and ones that use some type of hook to take over the beer. I like the former. Since I hear your mental thought of “Why?”. I will gladly expand. As I have said many times, I believe a beer should be well balanced. A well balanced beer will have subtle complexities that make the beer inviting, warming, and for want again. Brewers that make beers big and obnoxious to draw attention to themselves, seemingly narcissistic: “Hey, look what I can do. Everyone look at me.” Unfortunately these seem to be the beers that get most of the attention. After all isn’t it “American” to bigger, badder, bolder? No time for politics. 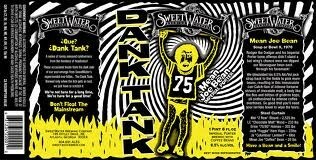 Dank Tank Mean Joe Bean by Sweetwater Brewing Company fits into that well balanced category. It uses coffee or some form of it to add a subtle complexity to a solid porter that is still the overall focus of the beer. The coffee adds a layer to the beer and doesn’t become the beer. Well done and worth your attention. Enjoy! Useless Fact: n 1982, a high school student from Los Angeles, California unscrambled the Rubik’s Cube in 22.95 seconds. American craft beer can’t escape: the fact that internet is a wealth of knowledge that cannot be completely trusted. While trying to find out information about by Weyerbacher Brewing Company, American craft beer number 239, I found conflicting material on the beer. One web site had the beer as no longer being made while Weyerbacher’s site had it under their “Brewer Selected Beers.” From past research I am not too fond of jumping on the breweries web site and belling what I see as some do a horrible job of keeping that information up to date. To be honest, after all that, I am not sure what is going on with this beer. I do know the bottle I reviewed had been in my cellar for 15 months. Hotel poured a deep brown that could be penetrated by a bright light. Flavor and aroma where similar: chocolate, sweet, and roasted malts creating a well manicured American porter. At times I thought I even could sense coffee and smoke. Quite easy to drink hitting the spot on a hot, humid day. If the beer is still made I would definitely have it again as I would like to find out the hop profile from a fresh pour. Enjoy! Useless Fact: The world’s tallest snowman was created in Bethel, Maine in 2008. It measured in at 122 feet / 1 inch and weighed 13,000,000 lbs. Or is a much smoother and well rounded version of Either. Similar profiles but Or doesn’t have the sweet stickiness of Either. Upon opening the bottle my nose was greeted with a splash of grapefruit hops that was a delight. More inspection found malt: roasted, chocolate, coffee, dark fruits, and caramel. All of these were in different proportions but all add a nice complexity to the nose. The mouth followed the nose, creating a delicious drink that had a bit of heat late. Creamy in the mouth with ample carbonation this beer was a pleasure to review. Enjoy! Useless Fact: Alfred Hitchcock directed the first talking film ever made in England. It was called Blackmail and was made in 1931. American craft beer continues to evolve with two of the newer concepts being cascadian dark ales and collaboration beers. Cascadian dark ales are sometimes referred to as black ipas. This style is credited with being developed in the north-western United States. Basically it is a style that takes a base ipa and adds some type of dark malts (roasted, chocolate, carafa, etc.) for complexity and color. The beer will have a delicate dark richness from the malts that comes through which is then uber hopped with Cascade or similar hops from the north west. Delicious in my opinion. Collaboration beers are ones in which multiple breweries get together to develop a recipe and possibly brew together, usually at one location or another. The collaboration can stretch more than two breweries but that is the usual. Either by Cigar City Brewing is both of the above: a Black IPA and a collaboration beer between Cigar City of Florida, Hill Farmstead of Vermont, and Grassroots Brewing of Denmark. Either is big and bold. In spite of the huge dose of hops this beer is all about the malt. If you had a sip without looking you would think it is an over-hopped stout, an imperial stout at that. Dark fruit, molasses, chocolates, roast, caramel, and host of other flavors and aromas come to together from the malt to give this a sweet backbone. Citrus hops are there to balance. The alcohol comes through a bit in the taste and along with the large amount of sugars makes it difficult to drink at times (my only complaint). Overall an interesting beer that maybe went to far and became a stout and a big one at that. Guess what is the next beer. Enjoy! Useless Fact: The oboe is considered the most difficult of all woodwind instruments to play correctly. Breweries in the Chicagoland have begun to pop up in a frantic pace over the past couple of years. For an area as populated as Chicago, each and every American craft brewery is well received and warranted. The next wave is upon us with New Chicago Brewing Company ready to blossom on March 4th, 2012: the 175th anniversary of the incorporation of Chicago. Samuel Evans and Jesse Evans, brothers, are the two behind the ambitious endeavor. 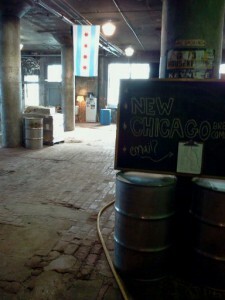 New Chicago is embarking on a journey that will see the brewery part of a self-contained zero waste facility. The Plant, an old meat packing building, is being reconditioned by Plant Chicago and a group of businesses such that all waste, products, etc will be reused in some way or another to create little to no footprint. 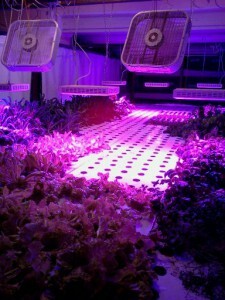 The brewery will use plants grown via hydroponics (a system in which plants (greens, mushrooms, and herbs), fish (tilapia), and waste from each feed and/or biologically keep the other) in their beers, while the waste (grains, water, and others) will be recycled back to that system via an anaerobic digester that will be underground behind the building. The anaerobic digester will use bacteria to eat the waste, turn it into gas, then, eventually, to create 850-degree steam. The steam will be used by the brewery to heat the water. The brewery itself will occupy the entire first floor of the building, which has laid dormant since 2005, some 15,000 square feet. The east end of the building will be home to a 2,500 square foot tasting room. The west end of the floor will have the brewing and fermenting equipment, while the middle will be bottling, kegging, and the like. 90% of the walls will be knocked down to create the open air environment the brothers are shooting for: one in which a person can be in the tasting room and see the activity in the brew house. The building is old which can be used to give that nice retro feel without much work. There is an old 40 foot long metal smoke house that is being cut up and used for bathrooms. The brick flooring is undulated, the plaster on the walls is being removed to show the old brick work behind, while modern energy efficient windows are being added to provide some charm. Up on the roof the space is being used to allow for growing of hops. Everything is being thought of, planned out, and executed with precision. New Chicago has already ordered their brewing equipment, a 15 barrel system, that will include four, 30 barrel fermentation tanks. The wort will be cooled by using the chill of the basement to their advantage: pumping it down and back up again. There will also be a three barrel incubation system for teaching and experimentation purposes. Classes will be held to teach people how to brew on the premises, too. Currently, with three other employees, the brewery should be built out sometime in October, start brewing in January, and kickoff in March. There will be three regular beers to start (guaranteed not to be regular): a lighter beer and two bigger beers. The coy brothers weren’t showing their hand but said their forte will be big beers. One-offs will be served in the tasting room while their mainstays will be kegged, bottled, and in six packs with a plan of 50/50 for the tasting room and distribution. Rich and I appreciate Samuel and Jesse having us out, showing us around, and sharing their enthusiasm for this great project. We wish them luck. If you have time and want to help out, give them a call as they can use any willing and able body. 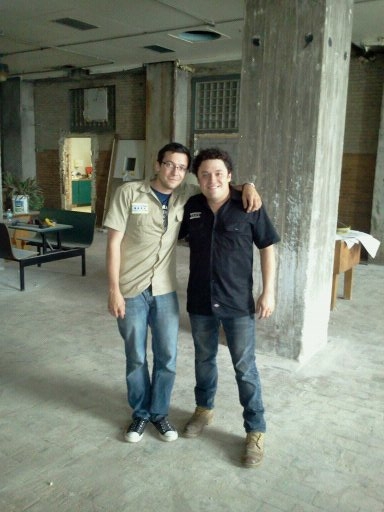 Can’t wait to find out about the beers and see the brewery take shape. Enjoy! An American craft beer on a Sunday evening is the final beer of the weekend and the beginning beer for a new week. It serves both those purposes so in my minds eye it should, and must, be an above average beer to stat off and end on the right foot. Rustwagen by Pennichuck Brewing Company is a Hefeweizen, which is one of my favorite styles, so I thought that it would be the perfect beer for a ceremonies Sunday. Rustwagen failed me. I had a hard time finding information on Pennichuck brewery, noticing that it seems to be out of business, therefore making it difficult to find much about Rustwagen itself. Based on my readings this beer might have some age on it, causing some of the foulness that I observed. I will definitely not have another as I don’t think that I could. If you happen across a beer from Pennichuck be careful as everything points to them being out of business and the chance of a fresh beer is slim. Enjoy! Useless Fact: During the Napoleonic wars, Napoleon’s soldiers bivouacked in the chapel of Santa Maria delle Grazie in Milan, where Leonardo’s Last Supper is located. The soldiers used the painting in target practice, shooting at the central figure of Christ’s head. This is why the face of Christ is almost obliterated in the painting. American craft beer in the garage? Yep, another batch of home brew on a Saturday. This batch is my wheat beer that has coriander and fresh orange zest added in the last five minutes of the boil. Had to start early as we had a family party to go to (of course I brought over some home brew). Had the batch finished around 1:00pm with a bit of difficulty getting down below 80 degrees because of the lovely heat. No worries, set it down on the basement floor and was ready to pitched when I got home. Of course it was before noon, but you can’t brew beer without having a beer. Especially when the heat coming off the burner mixes with the heat from the sun, making one feel like a marshmallow. At least that’s what I tell myself so I have a reason to have a beer: to cool down. American craft beer number 235 is 110k+ OT Batch #4 from Cigar City Brewing. Batch #4 of 110K+ OT doesn’t seem to be getting the reviews that past batches have but I liked the beer. There is a lot of sweetness to the beer as it is an American Imperial Amber Ale. To get the alcohol level you have to use more grain which gives more sugars. Pine and citrus hops both fight back the sweetness. Have this beer when you are hot (just standing outside for five minutes does this for me), you will appreciate this beer completely. Enjoy! Useless Fact: Children born in the month of May are on the average 200 grams heavier at birth than children born in any other month. One of the unexpected quirks of having dinner at The Bad Apple, the place is right across the street from Half Acre Beer Company. Since they closed at 8:00pm, I had enough time to score some fresh Daisy Cutter, a couple of pint glasses, and a t-shirt for the wife. Once seated, my wife and I browsed the beer list: good number of beers on tap (~20). I got a Devil Dancer by Founders Brewing Company for myself and a by Goose Island Beer Company for the wife. Devil Dancer is an old friend. It has been a couple of years since our last get together. I don’t know if my palate is starting to age and I can’t pick up the bitterness like I used to, if having this round of Devil Dancer on tap, or just my overall thirst contributed to the fact that this beer felt much more subdued. A big beer with tons of hops aroma, taste, and bitterness. The bitterness lasts but not the the extent it has in the past. All-in-all I like the tap version much more than the bottle, especially if the real difference is some semblance of balance. Good stuff. Enjoy! Useless Fact: As men and women get older their ability to hear high pitched sounds diminishes. The ability to taste sweet foods also decreases with age. You are currently browsing the Sips blog archives for July, 2011.